The collapsible coffee table chairs feature a comfortable interwoven Jute rope seat and hand carved Kikar wood frame. 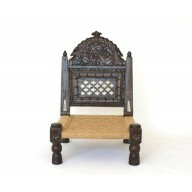 They are hand crafted in Rajasthan, India and imported into the USA. The seat cushions fit perfectly on these pidda chairs. They are great around a coffee table. 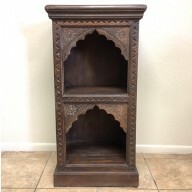 The Carved Arch Nightstand Cabinet is intricately hand carved from solid neem wood, with a wooden carved double arch. Each nightstand cabinet is carved from solid Neem wood, of the Mahogany Family. Neem wood is a solid dense hardwood with natural pesticide qualities. 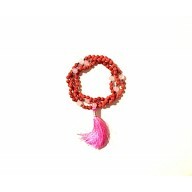 The Mini Rudhruksh Seed Mala is made from 108 Rudhruksh seeds. The Rudhruksh seed is believed to have healing properties, and protect against negative energy. 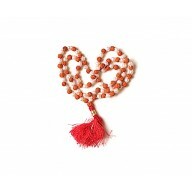 Mantras or chants can be recited while holding each bead individually, 108 times, as a meditative practice. The Brass statue of the Hindu God Ganesha represents, among other things, the power of new beginnings. He is believed to clear away the blockages in our lives, allowing us to reach our true potential, our true destiny. 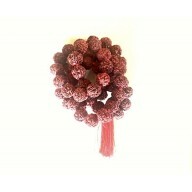 The Rudhruksh Seed Mala is made from 108 Rudhruksh seeds. The Rudhruksh seed is believed to have healing properties, and protect against negative energy. 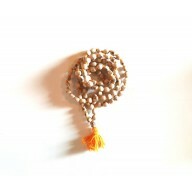 Mantras or chants can be recited while holding each bead individually, 108 times, as a meditative practice. The Tulsi Mala is made from 108 beads of light basil wood, knotted on each side to hold each bead in place. In Sanskrit language, Tulsi means "beyond compare" and is considered to be the elixir of life It is a nourishing and regenerating herb. Mantras or chants can be recited while holding each bead individually, 108 times, as a meditative practice. 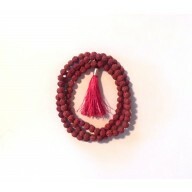 The Rosewood Malas are made from 108 beads of solid dark rosewood. Rosewood is traditionally thought to promote spiritual healing, nourishment, inner peace and compassion. Mantras or chants can be recited while holding each bead individually, 108 times, as a meditative practice. The Rudhruksh and Pearl Mala is made from 108 beads of alternating Pearl and large Rudhruksh seeds. The Rudhruksh seed is believed to have healing properties, and protect against negative energy. Pearls are tied in between each seed, for personal purity and integrity. Mantras or chants can be recited while holding each bead individually, 108 times, as a meditative practice. The Rudhruksh and Rose Quartz Malas are made from 108 beads of Rose Quartz and Rudhruksh seeds. The Rudhruksh seed is believed to have healing properties, and protect against negative energy. The Rose Quartz beads are framed by small metal beads, and are considered helpful for soothing the mind, and emotional balance. Mantras or chants can be recited while holding each bead individually, 108 times, as a meditative practice. Decorate your home with our line of handcrafted accessories, designed to perfection by expert artisans from across India. Add a touch of old world charm with an assortment of unique wooden trunks, featuring original brass clasps and hinges. Create a home altar by covering a low trunk or table with cloth, candles, and stone or brass statues. Silk Pashmina Shawls, woven to perfection with a blend of wool pashmina and pure silk, add grace to your dress and warmth to your shoulders. Shawls can also be used as an ornate piece of home décor, to add color to the sofa or grace to an altar table.